Digging through the deep archives of my emails, I found this gem of a sermon that my father preached at a church in Indianapolis in 2001. Among other things, it explains why our de facto family motto was "Fidelity is Up and Obedience is Down." I hope it influences you as much as it did me. As I was preparing the sermon for today I initially thought that I would tell you the story of Habitat for Humanity, how Millard and Linda Fuller in a time of spiritual crisis - career was going well, marriage was failing – went to Koinonia Farms in Americus, Georgia, for a retreat with Baptist preacher Clarence Jordan. They stayed there with Clarence until they had the breakthrough that gave their lives new meaning and purpose. While living in the community they became aware that many families there lived in run down shacks, some of those families were partner families of the farm. Something had to be done and the community was brought together to build for one another decent houses. Thus began Habitat for Humanity which is this year celebrating its 25th anniversary. But the more I worked with Clarence Jordan’s writings in sermon preparation the more I realized that that is not what he would do or want me to do. Our church’s participation in Habitat for Humanity’s 25th anniversary build is a slam-dunk. We will do that. But for Clarence Jordan the Gospel pulpit is not for infomercials, even for a cause as great as Habitat for Humanity. Clarence was a tough preacher. He made people feel uncomfortable. He was kicked out of more churches than he was invited into. Clarence kind of saw the Gospel as a 2X4 and the Church as a mule. Occasionally you have to whack the mule between the eyes to get its attention. Looking through Clarence Jordan’s old sermons I came across “The Three Young Students in a Fiery Furnace.” It was written in the days of the Civil Rights Movement and the Vietnam War, so I won’t preach his sermon but I want to use the same title and preach in the style and spirit of Clarence Jordan. A couple Saturday’s ago we were in the family minivan pulling out of the Wal-Mart parking lot, stopped at the light, sun warm through the windshield, windows down, light breeze, Jimmy Buffet on the radio and Teri said, “Life just doesn’t get any better than this.” And I agreed. Granted, we are simple folk and a Saturday that begins at the soccer field with Robbie, lunch at Taco Bell, a stop by Wal-Mart to pick up fertilizer, mulch and other garden supplies, motor oil, filters and other car supplies, then a day of yard work and changing the oil in the MG is a Saturday well spent. And life just doesn’t get any better than this. On a rainy, dreary, depressing day we know what the Gospel means. It means that the sun will shine again. Resurrection overcomes crucifixion, life beats death, and hope replaces despair. But on a beautiful day like today, what does the Gospel say to us? When everything is going our way and our lives are lives of privilege, how does the Gospel challenge us? Shadrack, Meshach, and Abednego were three young students enjoying the life of privilege. They were the best and brightest of the land, hand-picked to govern. They were trained in the best schools, they ate the finest food, and they dressed in the finest clothing. They were the spoiled and pampered pets of King Nebuchadnezzar. They were on the top of the world going up. All they had to do was embrace the king’s values, bow to his gods. No one was more disappointed in this turn of events than King Nebuchadezzar. His disappointment turned to frustration as he tried to reason with them and then to rage when they refused his command. He loved those young students and had given them everything a young person could ask for and he couldn’t understand why they would refuse to participate in the pageantry that celebrated his reign. He also needed them. Those sycophants who told on Shadrack, Meshach, and Abednego were useless to him. He didn’t need that kind of leadership. To run a kingdom he needed the kind of character that Shadrack, Meshach, and Abednego demonstrated. Every generation needs students like Shadrack, Meshach, and Abednego, the best and the brightest who will take our training and frustrate us with a solid refusal to work for our system, who will challenge the values of our institutions, even the Church. That is two. According to the story we need three. We probably don’t need many more than three. If you’ve ever had to live with these students, you know how difficult they can be. But every generation needs at least three young students who will stand up to us and refuse to participate in our institutions of power and wealth. Emily, Taylor, young people, we need you. Preachers like me are getting old and tired and we are too wedded to our pensions to go into the fiery furnace any more. We need you to do it for us. Parents, nurture your children toward authenticity. Teach them to be genuine and true. At the Naval Academy the answer to the question, “What’s up?” is “Fidelity is up and obedience is down.” That’s how you knew which way to wear the parade belt buckle. 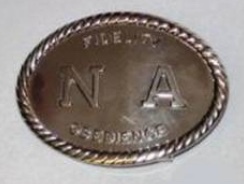 The word “Fidelity” was stamped on the top of the buckle and “Obedience” was stamped on the bottom. Its been a long time since anyone cared how I wear my belt buckle, the answer has stuck with me. Fidelity is up and obedience is down. Fidelity, faithfulness, genuine loyalty, true love trump blind, stupid obedience every day. Parents, nurture your children toward authenticity. Teachers, don’t teach toward the test. Teach toward the genius in each child. We are not running wiggit factories. We are creating geniuses. Teachers, teach toward the genius that is in every child. Captains of Industries, you Masters of the Universe, be afraid. Be very afraid. There are students out there who will take you down. They will take your scholarships, your gifts and your job offers and they will say, “No.” Some day you will invite a young student to your skybox and she will say, “No, thank you.” Be afraid of this student. Be afraid because her parents nurtured her toward authenticity and she lives with an internal integrity that you cannot buy. Because her teachers have given her the skill of critical thinking and she can see the truth behind the seduction. Because her church has introduced her to the God of justice, righteousness and compassion and she will not bow down to any other gods or serve their minions.